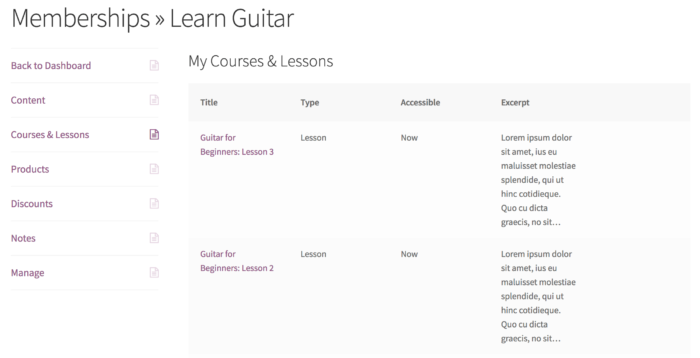 By default, Sensei lessons and courses are included in the “My Content” listing in the member area. However, if your site puts a strong focus on course content, you may want to show this information separately. If so, you can install this plugin to separate lessons and courses into their own member area section titled “Courses & Lessons”. After installing the plugin, you’ll now have a new member area section available in your membership plan settings. To add the Sensei member area section, go to your desired plans, and add the “Courses & Lessons” section to any plans you’d like, then save your plan. Now, for members with this plan, they’ll see any courses or lessons displayed separately from other content on your site in a new member area section. Courses and lessons will be removed from the “My content” section as well. Please double-check that your desires plan(s) have the Sensei section enabled — “Courses and Lessons” must be included in the plan Member area settings. Please double-check this and view the member area again as an active member of this plan. If you still don’t see the Sensei section, to rule out plugin conflicts, please deactivate all plugins except WooCommerce, WooCommerce Memberships, and WC Memberships Sensei Member Area, then re-check the shortcode output to see if the issue has been resolved. If you still see an issue with output, please switch to a default theme, such as Twenty Seventeen, and view the member area with the default theme and no other plugins. These steps resolve almost any display issue. If you’re looking for assistance with customizing the member area output further, we recommend reaching out to Wisdm Labs or Codeable for assistance with these sort of projects.